Eliminates odors quickly in up to 2,000 sq. ft.
Penetrates sheetrock to control hidden odor sources. safe for all types of carpet, draperies, and upholstery. 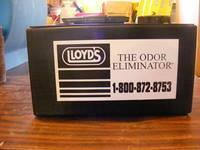 Removes smoke, mold and mildew odors. Non-Ozone, no fogging, no spraying. Dry vapor reaches in-accessable areas. Consumes approximately 1 oz of chemical penetrator per day. 4.5 oz. chemical recharge extra. * Please call us with any questions about our odor eliminator unit rentals in Oak Grove MO, Blue Springs MO, Independence MO, Lexington MO, Odessa MO, Independence MO and Western Missouri.